June 19th is the Official National Martini Day - Celebrate w/ this Wild Martini! 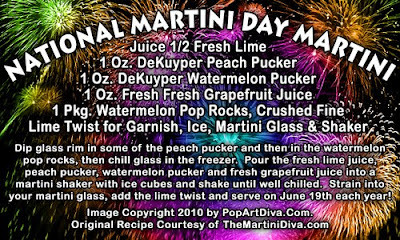 Make no mistake about it, June 19th is the Official National Martini Day. The National Martini Day Martini. This wild martini is an explosion of lip puckering watermelon and peach Pucker with some extra sour from fresh grapefruit juice with a - get this - watermelon flavored pop rocks rim! It's daring, it's totally fun and it's really tasty!